Called in to rescue a cabinet minister and his aide whose chopper went down on the wrong side of the border, Major Dutch (Arnold Schwarzenegger) and his elite tactical team of military covert operatives assume that their latest assignment will progress like any other but once they land in the jungle, their surroundings come alive and begin to hunt them. However, the audience has the benefit of added knowledge in understanding that the vicious, untrackable, human skinning predator with whom they're squaring off is in actuality a creature from another intergalactic location thanks to a fast, opening sequence bringing us into outer space. Unfortunately, it takes the body count to increase and rounds of ammo to hit nothing in sight for the small group of soldiers to understand that something about this assignment isn't quite right. 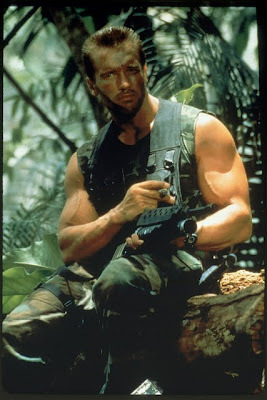 And although Carl Weathers, who sent Dutch's soldiers into the mess may reveal that the military considers his troops expendable, when the creature begins picking off the men one at a time, Dutch steps up efforts to prove just how vital the forces are. Despite this attempt, in Predator audiences can primarily tell the men apart based on either a prop or catchphrase from Jesse Ventura's disgusting chew habit or another character's obsession with getting laughter from a lame dirty joke he can't quite spin the right way. Thus what begins as a traditional “guys on a mission” movie quickly turns into a strange hybrid of action/horror and science fiction that gives us a militaristic spin on the sort of blood and guts slasher movie box office successes of the 1980s along with a land-based take on Ridley Scott's Alien. And even though the final act that sends Schwarzenegger in the mud to give us Die Hard director John McTiernan's own send-up of Martin Sheen coming out of the swamp in Apocalypse Now, the film still goes on far too long and feels like it's an entirely different picture than the first half. 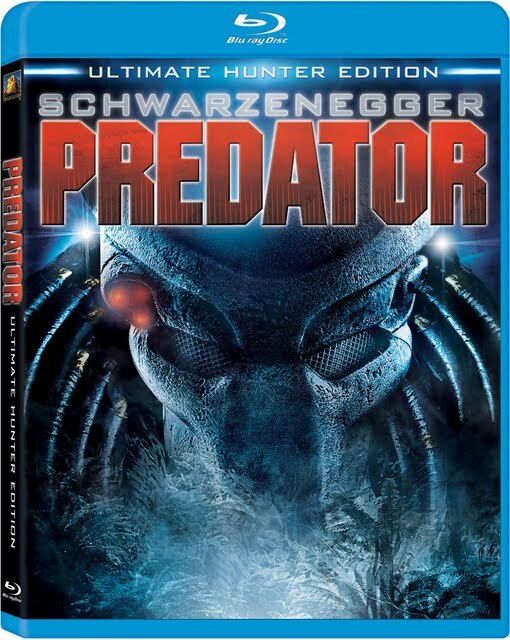 However in comparison with some of Schwarzenegger's other '80s works, Predator, which spawned a franchise including a 2010 installment, holds up fairly well on Blu-ray. Creature crafter Stan Winston's extra-terrestrial half robotic/half mutant predator still terrifies us more than twenty years later, testing the mettle of moviegoers who, like me, were originally somewhat clueless going in that Dutch's mission would move from special ops to horror gore. Moreover, Predator is filled with tongue-in-cheek catchphrases delivered with deadpan perfection by Ventura and the others via lines like, “I ain't got time to bleed” and this “makes Cambodia look like Kansas” which make us wish that the supporting cast hadn't been axed quite so quickly. Predator: Ultimate Hunter Edition also offers a bevy of bonus material including a featurette on the digital restoration of the film that's the first of three brand-new extras included along with the old special features that had been previously showcased on the earlier debut of the Blu-ray edition. While the age and quality of the print does still date the film and make it appear slightly grainy in the transfer, overall it's still an impressive presentation of the 1987 movie. Yet it remains one wherein, despite a few spectacularly intense action sequences from McTiernan, the mixture of horror and science fiction with action just doesn't work quite as successfully as it did in some of Schwarzenegger's other hybrids such as James Cameron's vastly superior Terminator series.